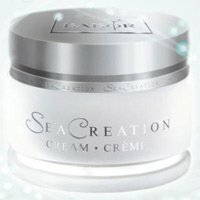 Babor Seacreation Cream - Is is possible that the ocean holds a beauty secret? Babor has bottled anti aging powers. The ingredient Thermophilius claims to protect the beauty of our skin and literally reverse the aging process. With just one application test results revealed a 28% increase in free radical protection, 40% moisutre improvement, and a 29% reduction in the depth of wrinkles. The cream also has unique actie ingredients such as pearl proteins and sea silk. So what does this mean for you? It means the bottle is expensive. $400 plus dollars to be exact. But for those who can afford it and want to give it a try, it sounds promising. Water (aqua), Squalane, Sesamum Indicum (sesame) Seed Oil, Cetyl Alcohol, Steareth-2, Steareth-21, Persea Gratissima (avocado) Oil Unsaponifiables, Thermus Thermophylus Ferment, Glycerin, Sorbitol, Tocopheryl Acetate, Sea Salt (maris Sal), Hydrolyzed Conchiolin Protein, Sericin, Algae Extract, Hydrolyzed Algae Extract, Fucus Vesiculosus Extract, Glutathione, Prunus Amygdalus Dulcis (sweet Almond) Oil, Triticum Vulgare (wheat) Protein, Panthenol, Bisabolol, Whey Protein (lactis Proteinum), Glycine Soja (soybean) Oil, Tocopherol, Biosaccharide Gum-1, Ascorbyl Palmitate, Lactose, Caprylic/capric Triglyceride, Butylene Glycol, Propylene Glycol, Dimethicone, Xanthan Gum, Palmitic Acid, Disodium EDTA, Stearic Acid, Lactic Acid, Ascorbic Acid, Sodium Hydroxide, Citric Acid, Fragrance (parfum), BHT, Alcohol, Geraniol, Citral, Limonene, Linalool, Hexyl Cinnamal, Citronellol, Phenoxyethanol, Methylparaben, Ethylparaben, Propylparaben, Butylparaben, Isobutylparaben, Sorbic Acid, Potassium Sorbate. Apply in the morning and evening after skin has been cleansed.